A unique opportunity to purchase this FIVE BEDROOM detached bungalow set on Green Belt land in grounds of approx, FIVE ACRES comprising large family gardens, a Grade II listed windmill, PADDOCKS AND STABLES. This superbly well maintained family home and former nursery is SURROUNDED BY OPEN COUNTRYSIDE. 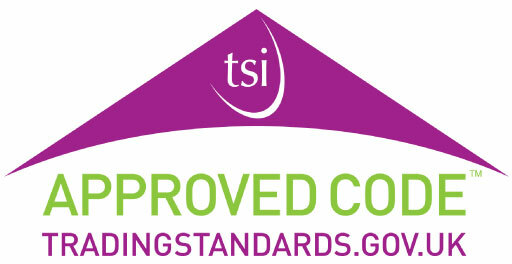 EPC rating D66. 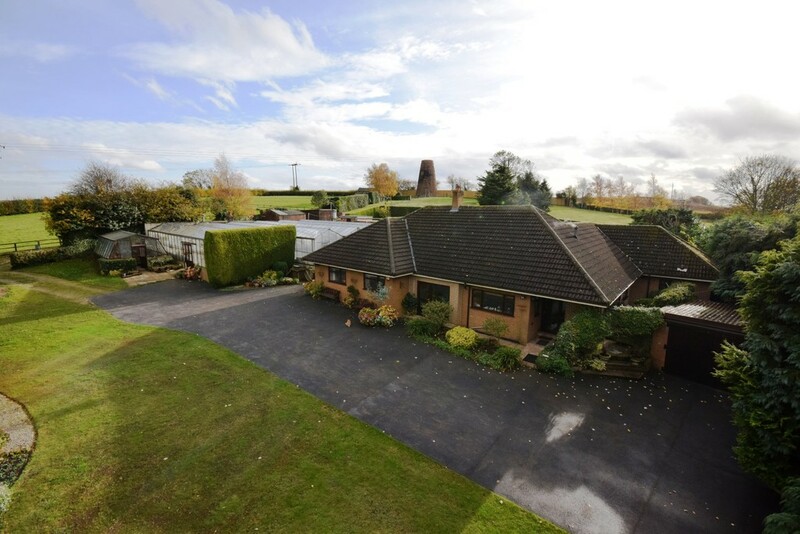 A unique opportunity to purchase this five bedroom detached bungalow set on Green Belt land in grounds extending to approximately five acres comprising large family gardens, a Grade II listed windmill, paddocks and stables. This superbly well maintained family home and former nursery is set in the rural village of Darrington, on the south side of Pontefract being surrounded by open countryside yet having excellent access to road and rail links for those wishing to commute. Machir offers spacious and cleverly designed accommodation that over the years has been stylishly extended offering versatile accommodation which may be suitable for those seeking a separate annex. This property is designed to enable optimum enjoyment of the delightful garden and grounds from all principal rooms. An internal inspection will reveal an innovative arrangement of accommodation with impressive reception rooms connected to the extended bedroom wing by a garden/sitting room. Approached via Moor Lane through gates which lead on to an extensive tarmacadam driveway providing ample parking for several vehicles. There is a double garage attached to the bungalow in addition to a range of other garages/stores. Vehicular access also to two paddocks (each approximately 1 acre). To the rear of the gardens there are two stables and further paddock/storage sheds. The former green houses are still in situ, all having lighting and partially having heating. Many of the outbuildings are ripe for further development or renovation, subject to any necessary planning and building consents. A full internal and external viewing is strongly advised to see the full potential this home has to offer. ENTRANCE PORCH 8' 5" x 7' 11" (2.57m x 2.42m) UPVC double glazed front entrance door leading into the entrance hall. Tiled floor, double glazed windows to the front, single glazed window overlooking the inner hallway and glazed door accessing to inner hallway itself. INNER HALLWAY Central heating radiator and three good sized storage cupboards. 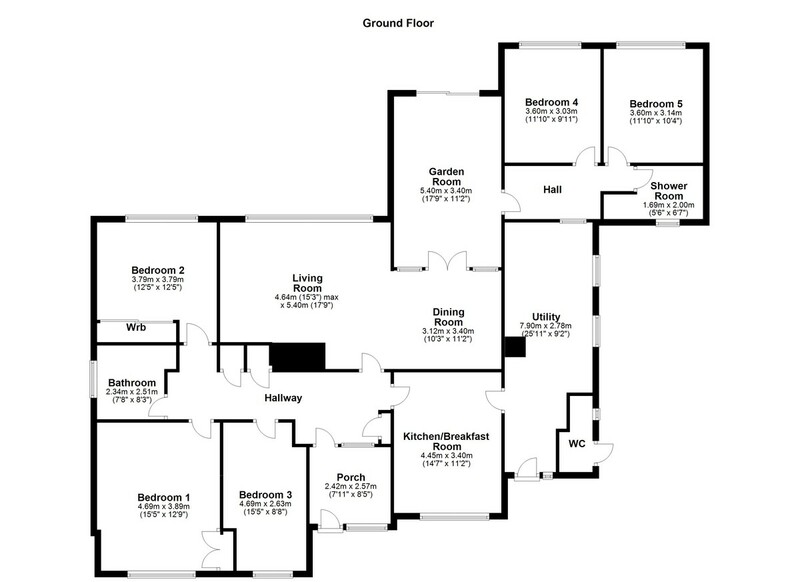 Doors lead to the open plan living/dining room, kitchen, three bedrooms and bathroom/w.c. - LIVING AREA 17' 8" x 15' 2" (5.40m x 4.64m) Large double glazed window overlooking the rear garden, coving to the ceiling, T.V. and telephone points, two central heating radiators and a feature fireplace with wooden surround housing a living flame gas fire. - DINING AREA 11' 1" x 10' 2" (3.40m x 3.12m) Double glazed window to the side overlooking the utility room, coving to the ceiling and glazed French doors leading to the garden/sitting room with matching glazed side screens. GARDEN ROOM 17' 8" x 11' 1" (5.40m x 3.40m) Double glazed sliding patio doors to the rear garden, coving to the ceiling, wall lighting, central heating radiator and a gas fire on a marble hearth. Door to the extended wing leading to two additional bedrooms and shower room/w.c. BEDROOM FOUR 11' 9" x 9' 11" (3.60m x 3.03m) Double glazed window to the rear, coving to the ceiling and central heating radiator. BEDROOM FIVE 11' 9" x 10' 3" (3.60m x 3.14m) Double glazed window to the rear, coving to the ceiling and central heating radiator. SHOWER ROOM/W.C. 6' 6" x 5' 6" (2.00m x 1.69m) plus recess Three piece suite comprising tiled shower cubicle with electric shower, low level flush w.c. and wash hand basin set onto a vanity unit with tiled splash back. Extractor fan, double glazed window to the front and central heating radiator. KITCHEN/BREAKFAST ROOM 14' 7" x 11' 1" (4.45m x 3.40m) Comprising a range of solid wood wall and base units with laminate work surfaces, tiled splash back and an inset single bowl sink and drainer. Integral appliances include double electric hob, four ring gas hob with extracting filter hood, fridge and dishwasher. Double glazed windows to the front and side, central heating radiator and downlight spotlighting. Door leading to the utility room/side entrance. UTILITY ROOM/SIDE ENTRANCE 25' 11" x 9' 1" (7.90m x 2.78m) A range of base units with laminate work surfaces and an inset ceramic Belfast style sink. Plumbing for a washing machine, space for a dryer and space for additional fridges/freezers. Central heating radiator, two double glazed windows to the side aspect, single glazed window overlooking the side hall and UPVC double glazed external front entrance door. BEDROOM ONE 15' 4" x 12' 9" (4.69m x 3.89m) Double glazed window overlooking the rear garden, central heating radiator and built-in wardrobes and dresser. BEDROOM THREE 15' 4" x 8' 7" (4.69m x 2.63m) Double glazed window to the front and central heating radiator. BATHROOM/W.C. 8' 2" x 7' 8" (2.51m x 2.34m) Four piece suite comprising bath, tiled shower cubicle with electric shower, wash hand basin and low level flush w.c. Part tiled walls, double glazed window to the rear, central heated towel rail and ceiling coving. OUTSIDE The plot totals approximately five acres with generous gardens to the front and rear, two paddocks, two stables, additional land to the rear, multiple greenhouses and a feature grade II listed former windmill. Gated access onto a large tarmacadam driveway providing ample parking for several vehicles leading to a double garage and further access to neighbouring paddocks and garages/outbuildings. Please note, the bungalow was originally set on a two acre plot, which retains a covenant restricting this part of land to contain one single dwelling. VIEWINGS To view please contact our Pontefract office and they will be pleased to arrange a suitable appointment.